Perform the FAA BasicMed Exam for Pilots! Learn to Perform the BasicMed exam correctly! FAA Aviation Medical Examiner Certification Not Required! There is no requirement to become a FAA Aviation Medical Examiner to perform the BasicMed medical exam for Private pilots! This comprehensive course contains all the details to perform the BasicMed exam for Flight Instructors, Student, Recreational and Private Pilots. Includes FAA terminology, FAA recommendations, and administrative procedure. The new BasicMed program allows most “General Aviation” pilots obtain a BasicMed exam in lieu of obtaining a 3rd Class Airman Medical Certificate performed by an FAA Aviation Medical Examiner. This more simplified medical exam has it’s own regulation, procedure, forms and requirements for both pilots and the BasicMed provider. Using FAA recommendations and aeromedical resources, learn how to perform the BasicMed in your office correctly. To Register (Click Here) After selecting your profession, search for “FAA BasicMed Physician Training”. MDs and DOs: Can perform the BasicMed exam in all states without being a FAA Aviation Medical Examiner. ANPs/PAs: May perform all or part of the exam per state regulations, with the exception of signing the BasicMed Medical exam Checklist. The Checklist must be signed by the “state licensed physician” responsible for the exam. Others: Professions determined by their state licensing board to be a “state licensed physician” with scope of practice to perform all elements of the BasicMed exam. Looking for a BasicMed Exam Near You? 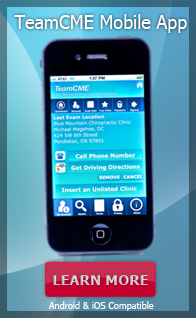 Get the TeamCME Mobile App! Be the Recognized Expert in your area! Out-Innovate, Out-Service, Out-Market and Out-Compete the competition!